Hi,I'm Mara Friedland. I have a Masters in Fine Arts, with a concentration in Metals. My jewelry and metalwork are inspired by the components of nature that are not often seen at first glance. All pieces are designed and fabricated by me! The work is one of a kind and limited edition collections. Flowers capture my interest most and I am seduced by not only the color, but the patterns and repetitious shapes. I am fascinated when looking at a blossom closely, as if I had a magnifying lens, finding beauty in even the tiniest shapes and spaces. 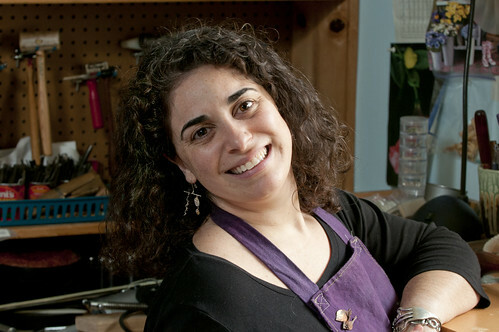 In my jewelry, I enjoy using silver, gold, resin, or the luminous surfaces of enamel to reference the colors and patterns in nature and celebrate these intricacies. To minimize my impact as a maker on the environment, I use recycled metal, look for responsibly mined gemstones, and use non-toxic material wherever possible.